The phrase ipse dixit is Latin for “he said it himself” and refers to an assertion without proof or a dogmatic expression of mere opinion. 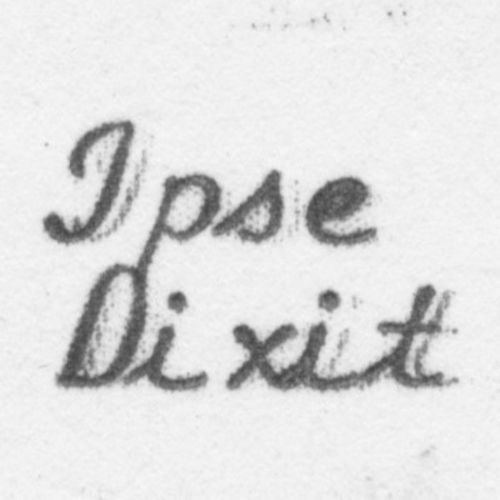 (Here is the Wikipedia entry for ipse dixit.) This phrase now also refers to a new podcast series hosted by one of our favorite legal scholars Brian O. Frye, who teaches at the University of Kentucky. (FYI: the graceful logo of the podcast is pictured below. We have previously blogged about Professor Frye’s fascinating work on the Zapruder film (see here) and his revisionist history of the facts in Erie v. Tompkins (see here); in addition, here is a master link to his scholarship.) In his podcast Professor Frye interviews sundry legal scholars on a wide variety of topics, so check out the podcast at your leisure. By way of example, Professor Frye has already interviewed Eric Segall on “Originalism as Faith,” which explores the various shades of originalist constitutional interpretation; Valena Beety on “The Overdose/Homicide Epidemic,” which explores the role of coroners in classifying overdoses as homicides; and Ramsi Woodcock on “Efficient Queues,” which explores the theoretical relationship between queues and prices. Update (10/9): We have now joined this illustrious group of scholars! You can listen to Prof Frye and me talk about “Goedel’s Loophole” here, where we revisit the story about mathematician Kurt Goedel’s discovery of a logical contradiction in the U.S. Constitution.